We’re so lucky in the UK because our temperate climate means that we have an amazing choice of plants that we can grow in our gardens. There are literally thousands of species that are tried and tested and you’ll be sure to find many varieties of plants that will fit in with your taste and design style. Having so much choice actually makes the job of designing a new planting scheme quite challenging because there are so many options and combinations that will work together. It’s hard to know where to start. Knowing your garden is the first place to start. What soil do you have, is it heavy clay that’s wet in winter and like concrete in summer or is it free-draining sandy soil that’s easy to work but low in nutrients? What’s the aspect? Does your garden face north and get very little sunshine or is it south-facing which means that it’s pretty hot all day? Make a note of which parts of the garden get the most sun and at what times of the day. Are there dry corners or wet patches? Is there a section of the garden that has to withstand windy conditions? Once you’ve established the soil, aspect and drainage of the site, you’ll be in a much better position to select the right plants for the right place. The RHS have a brilliant ‘Plant Selector’ on their website which enables you to enter your criteria; soil, aspect, drainage, season of interest, colour, plant type etc. and it will provide you with a list of plants that meet these criteria. When you begin to put your planting scheme together, try to think of it as a painting. Each plant will have its own unique shape which will bring interest and texture to the overall look and feel of the planting. You’ll need some evergreen plants to provide all year round interest – winter flowering shrubs are great because often they have wonderful scented flowers at a time when the garden is rather bereft of colour. The key to successful planting is to keep it simple, limit the number of species you use and where possible, depending on the conditions of the site, repeat the planting patterns around the garden to create a rhythm. If the conditions differ then try to pick up specific features of a plant that will create the same feeling. If you have Lavender in a hot dry border, for example, then you could use something like Nepeta (Cat Mint) which will happily grow in semi-shade. 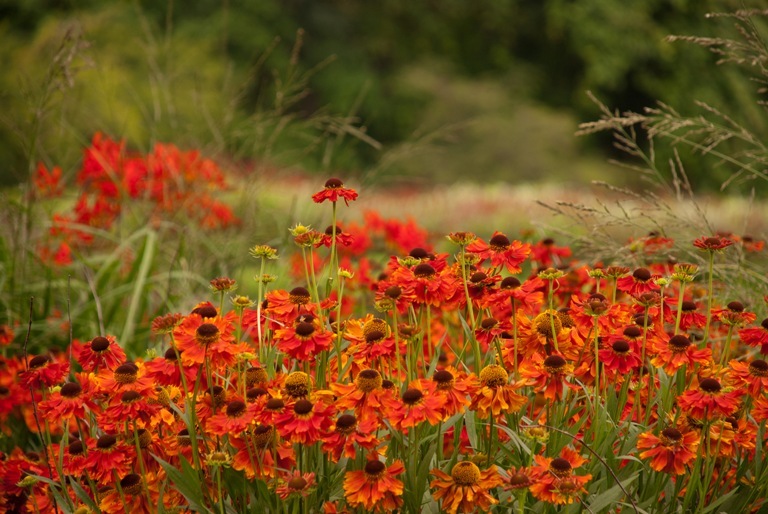 Planting clumps or swathes of the same plant will bring more depth and unity to the garden. Odd numbers work really well especially in small spaces where every plant counts. Professionals always use large numbers of the same species of plant. I recently planted a small garden that used just 10 species of plants. If I’d used more it would have felt as if there was too much going on. Flower colour is also important, but it should really be the final selection criteria when you are choosing your plants. If the structure and form of the plants don’t work it won’t matter how pretty the flowers are, it won’t ever have the same look and feel as the pictures you’ve swooned over in magazines. Choosing the colour of the flowers will be very much down to personal choice. Do you prefer warm, hot, vibrant colours or romantic, pastel shades? Whichever you prefer, try to choose flowers that are harmonious with each other.